Cats may also play or threaten with a swipe of their paws. Play swatting with other cats seldom leads to injuries; usually their claws are retracted during play, and cats are well protected by their thick skin and coat. When play does get a little rough, cats will usually sort out their differences, though sometimes it may escalate to inter-cat aggression that can lead to injuries that require veterinary attention. Think about why the cat is doing what she’s doing. For example, owners may feel frustrated when their kittens begin to climb furniture. Remember that kittens can’t leap the way adult cats do, so they use their needle-sharp claws to climb. This is not intentionally destructive, and you can prevent it by providing an option. For example, if your kitten climbs the bedding to get up on your bed, place a scratching post beside the bed or low stool so she can take two short leaps instead of climbing. The same is true as your cat gets older and her stiff joints keep her from jumping as she used to. A post placed immediately beside the sofa or armchair that is being climbed serves the same purpose. Your cat wants to mark your belongings (and in effect, mark you) as part of her territory, so place scratching pads and posts in areas where you spend a lot of your time. *Cats scratch mark in high traffic areas where you and they pass through each day* Cats mark with urine and feces around the perimeter of their space. Scratching posts should be placed in prominent areas. Stability plays a big role in determining whether a cat will use a particular scratcher. For example, the scratchers made to hang over a doorknob are unstable; consequently many cats won’t use them. You can instead take that scratcher, cut off the hanging loop, and lay it on the floor for use as a horizontal scratcher (more about those below). After all trees, deck railings, sofas do not sway or move, this is one reason they are so appealing. The post covering is important! Store-bought scratching posts are usually covered with carpet pieces which won’t help your cat remove the outer nail sheaths. You can’t expect the cat to know the difference between the carpet on the post (OK to scratch) and the carpet on the floor (off-limits). The best covering is sisal fabric; the next-best option is tightly wound sisal rope. Carpet-covered perches can be an acceptable option as a cozy bed, but not for scratching. Some cats prefer a horizontal or slanted surface rather than a post. If you don’t provide an appealing scratching option, then the back of your sofa may look awfully inviting! Consider getting a sisal-covered scratching pad or corrugated cardboard scratcher, which can lie flat on the floor. For a slanted option try a sisal scratch ramp or corrugated cardboard ramp. If the cat continues to use one or two pieces of furniture, consider placing a scratching post directly in front of the furniture that is being scratched, or placing a cat condo near the area. Take a good look at the surfaces of the scratched furniture; since the cat clearly likes that material, make sure that her scratching post is covered with an even more preferred texture. Simultaneously, make the piece of furniture unappealing using Sticky Paws (double sided sticky tape made for this very purpose), double sided carpet tape from a home improvement store, or even a citrus scented spray (cats do not like citrus scents). See below for more details on deterring undesirable scratching. Feliway is a synthetic product that mimics feline facial pheromones and aids in curbing destructive scratching. (It’s also used to treat aggression and inappropriate elimination.) It is available in a spray or as an electric diffuser; to deter destructive scratching, we find the spray to be more effective for scratching purposes. Apply it daily to the area that you do not want the cat to scratch. The spray dissipates over a 24-hour period, just as natural scent marking does, which is why you need to reapply daily. We’d be happy to discuss use of this product with you. Clicker training can be a very effective tool for training your cat to scratch in the right places. In fact, scratching on a post is one of the easiest behaviors to train! Reward use of the post and ignore any interest in the furniture. Soon your cat will be scratching the post just to receive praise and treats from you! The sisal-weave posts, scratching pads and ramps available through this website work better than any other post that we have seen. 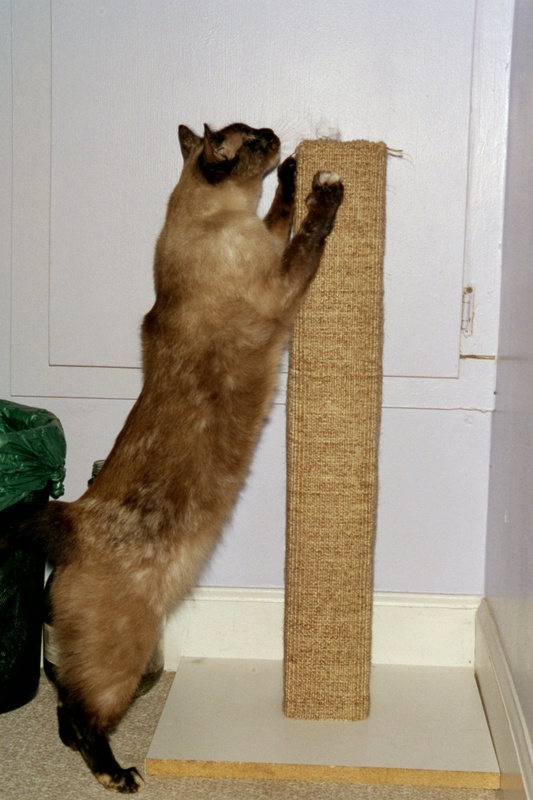 They are designed to meet your cat’s needs for a tall, sturdy scratching post, and are meticulously hand-crafted. Keeping your cat’s nails trimmed will minimize damage done if your cat occasionally strays from the post. As a last resort, there is a product called Soft Paws. They are plastic caps you put on the tips of a cat’s nails using a non-toxic adhesive. Most clients find it unnecessary. Soft Paws are a temporary fix because they will not change the cat’s behavior; they just temporarily curb the destruction. Here is a helpful video illustrating all of the above points! There are many reasons why cats scratch. By being considerate of her needs and conscious of your decisions, you can provide her with appealing and appropriate places that meet her need to scratch, and she’ll leave your furniture alone. There is never a need to declaw a cat to eliminate undesirable scratching behavior! Please visit www.pawproject.org to learn more. Filed Under: Hand Out Tagged With: detering unwanted scratching, Feline scratching behavior, how to get a cat to use a scratching post, scratching post basics, Sisal scratching posts, why do cats scratch?